You will be given a reference e-book to read which has 354 pages And the test will be based on that e-book , you can take final test within 1 year of purchase. Lean Six Sigma or the method of combining the strategies and tools used in both the Lean performance method and the Six Sigma method has been confirmed as one of the most powerful tools necessary in eliminating wastes and enhancing the performance and operations of any organization. Because of the continued success of the Lean Six Sigma method in helping owners of organizations build up a more productive and profitable business, different programs for Lean Six Sigma are introduced to the public. The Lean Six Sigma statistics certificationprogram is included among the most popular ones and it aims to provide practitioners with statistical guides and approaches that they can use in handling problems that may arise when managing and implementing projects for Lean Six Sigma. The Lean Six Sigma statistics is also viewed by experts as an essential method which offers professionals with high quality mathematical tools, worked equations and case studies necessary in improving all processes within a workplace. The entire method is focused on interpreting transactional data, detecting process delays, measuring potential capability and confirming any influential delay time. Lean Six Sigma statistics also works in delivering intense, quantitative and hard-core working instruments essential in minimizing wastes in your organization while also maximizing efficiency in all your operations. Taking a Lean Six Sigma statistics certification program can help you understand completely how the entire method works and provides you with a background of each statistical tool used including lean metrics, lean process capability, binary logistics and transactional project environment. Becoming a certified Lean Six Sigma statistics professional is now possible with Brainmeasures Lean Six Sigma statistics certification program. Brainmeasures is highly recommended for everyone because it has an ISO certification and is popular for being the leading employment testing and online certification company at present. The Lean Six Sigma statistics certification program provided by Brainmeasures to practitioners is developed by real experts in the industry with an aim of providing the most desirable Six Sigma training possible. You will have to take the Six Sigma exam which comes along with the Brainmeasures Lean Six Sigma statistics certification course as a means of assessing your skills and knowledge about the entire Lean Six Sigma process. Passing the exam will allow you to receive your certificate while also providing a guarantee that you will become successful in your chosen career path. 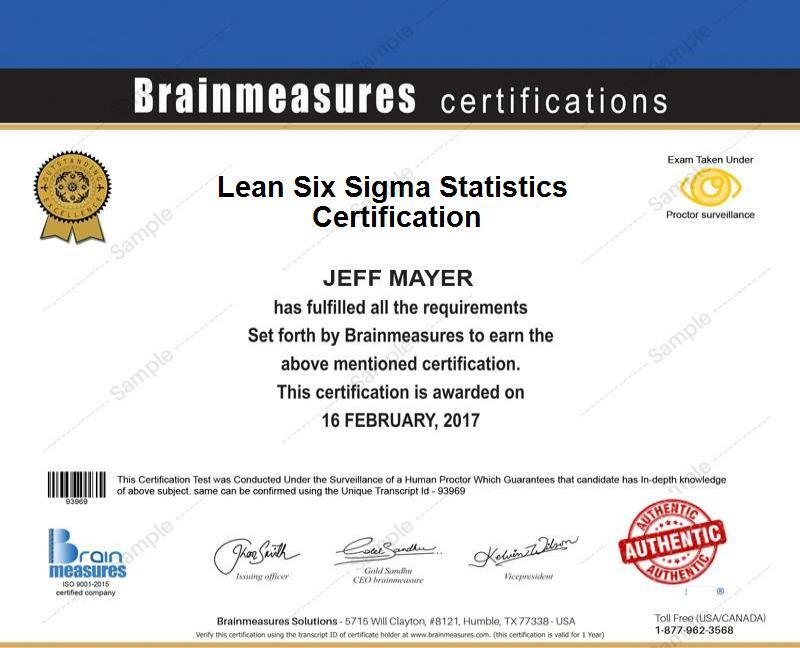 There are still a lot of topics covered in the Lean Six Sigma statistics certification program from Brainmeasures and you can view them after logging into your registered account and accessing the detailed syllabus. All the people within an organization starting from those that are holding the highest ranks up to those that hold lower positions can benefit in the Lean Six Sigma Statistics certification program. Employees and high-ranking officials in an organization are encouraged to enroll in the program to improve their efficiency and productivity. If you have your Lean Six Sigma statistics certification, then your chances of getting a better job and a higher salary are increased. You can earn from $45,000 to $135,000 annually if you are a certified Lean Six Sigma statistics expert.